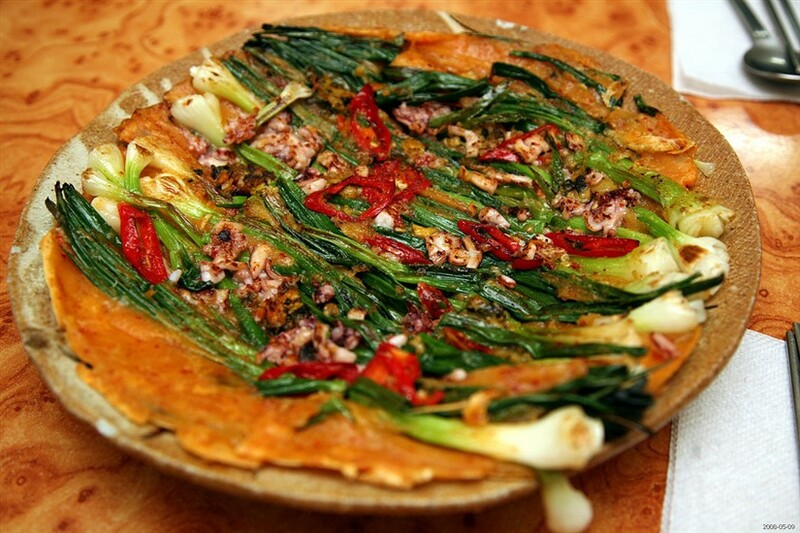 Jeon is a type of Korean style pancake.However, instead of being a sweet breakfast food covered in maplesyrup, jeon is often of the more savory variety. With many differentvariations, it is a common appetizer or snack. 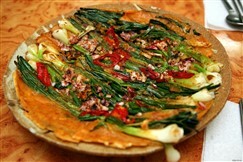 Pajeon uses greenonions as its prominent ingredient, and it is one of the mostrecognizable versions of this traditional dish. The basic batter of jeon is simple-eggs, flour, salt, and water, though additions of soybean paste andsugar are not uncommon. 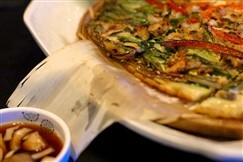 In the case of pajeon, green onions are friedin a pan while the batter is poured over. 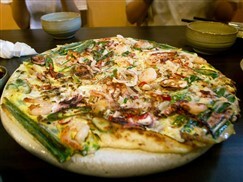 After cooking a coupleminutes, the result is a salty, savory, crispy pancake that is aperfect starter or side to a meal. The dipping sauce that is usuallyserved with pajeon is a mixture of soy sauce, vinegar, choppedonions, chili peppers and garlic. The pancake, large in size, issliced into bite sized squares that are prefect for dipping in thecondiment. I'm a jeon fanatic. It's probably one of my favorite Korean dishes. Even bad jeon is good. So many different types (pumpkin and seafood are probably my favorites), but always best hot and crispy. I always cook pajeon (and any type of jeon) at home. It's tasty and simple but its diversity of taste with anything you combine with it takes a complete turn to this humble dish.